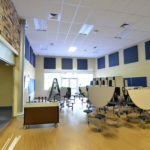 Classrooms Soundproofing – Many of modern classrooms that are being constructed today encourage hands -on activities and discussion resulting in increased activity and noise issues in a class room, in addition to these distractions in busy learning environment, there are many other back ground noises present in classrooms, like HVAC systems and computers etc. Children specially under the age of 13 have under developed sense of hearing, background noises impact their ability to hear, comprehend and thus learning ability. Also, speech intelligibility decreases when echo and reverberation is present within the space of classroom, Reverberation occur when sound waves strike a hard surface like walls, floor and ceiling in a room and reflected into the space, loud reverberant classrooms may cause the teacher to raise their voice on a regular basis, leading to increased stress both for teacher and students alike. All Noise Control has solutions to combat these acoustical issues that can be put into place during the design and planning phase as well as some that can be implemented after a class room is built and already in use. Acoustical Ceiling Tiles, we have a large variety of acoustical ceiling tiles for sound control and noise reduction. We carry ceiling tiles for dropping into your standard ceiling grid or tiles may be glued directly to your ceiling, All Noise Control has ceiling tiles with high NRC for sound absorption and STC rated tiles for sound blocking. Ceiling tiles with a Vinyl sound barrier backing are used to block noise from an open plenum. Beyond acoustical problems in classrooms, All Noise Control can help with other spaces within educational facilities such as gymnasium, band room, auditoriums, libraries, choir rooms and swimming pool area. Each of these spaces needs to be treated differently and at All Noise Control, you can choose products suited to your specific needs including: plain and fabric wrapped wall and ceiling tiles, Baffles and Banners, sound diffusers, sound blankets and more to maximize the quality of sound and the appearance of your facility.